Kazakhstan is located in the central part of Asia. It is the ninth largest country on our planet. More than two thirds of populations are Muslims. Little over a quarter of people in Kazakhstan are Christians. Not all parts of the year are favourable for the wedding. Ramadan is avoided as people then fast. As to the folk belief one should not marry in January as the bride will have difficulties in getting pregnant. The most popular season for weddings is autumn. A Kazakh bride traditionally wears red wedding dress. But nowadays many of them wear western style white dress. Matchmakers play a very important role in every Kazakh wedding. A matchmaker starts his mission in a traditional arrival to the bride's home. This is called "kudalyk". The matchmaker tries to negotiate the positive answer to the groom's wish to get married with a particular woman. Some presents are brought. In the case of the positive outcome there is "shege sapa" where the bride's father gives a coat to the matchmaker. There is a culinary proof that there will be a wedding. For this purpose people traditionally make a dish called "kuyruk bauyr". "Kyz uzatu" is an event when early in the morning bride leaves her home and goes to the groom's one. In the evening before this event the matchmaker arrives again. He is accompanied by an odd number of people. The groom's family welcomes the bride in the event called "kelin tusiru". The bride is officially presented to the groom's family. It is done by removing the veil off her face. Her future mother-in-law then kisses her and put the white scarf on her head. This tradition is called "betashar". Everything is accompanied with the performance of traditional epic song or "zhyr". 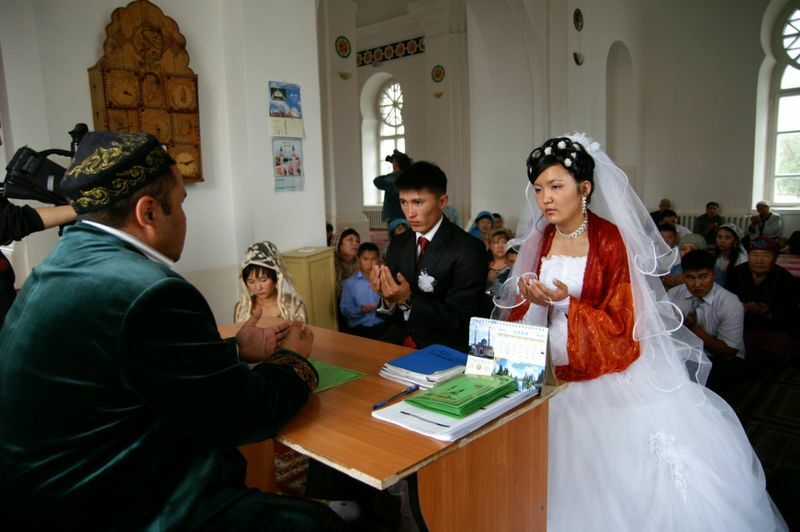 The religious wedding ceremony in Kazakhstan is known as "neke qiyu". The "neke qiyu" is performed by the local mullah. The couple sits in front of him during this about 30 minutes long ceremony. According to an old tradition the couple must drink some water with little bit of sugar and salt dissolved in it. The couple must also get married in the state office. This ceremony is known as the "AHAZH". In Kazakh cities the couple and their guests then get in cars and go to some of city sights where the wedding Image(s) are taken. The wedding reception includes up to 300 guests. All the costs of the reception are paid by the groom's family. The day after the wedding the groom's family organizes a "kelin" tea ceremony. A bride serves tea to every person present there. They give her some money.